Tabletop to Heidelberg - too fast? About two months ago I got my very first press - a gorgeous C&P Tabletop from Don K Black. So far it’s been a wildly incredible experience. I’ve learned so much in such little time and am simply having a blast. I recently came across a post on Briar about a Heidelberg Windmill 10x15 for sale nearby. I know it’s soon, but I also know myself and this is something I am taking seriously and am incredibly passionate about. I know I’ll eventually want to take myself to the next level - but I thought that might be a Golding Pearl and then a Heidelberg…kind of a: step 1, Tabletop, step 2, Golding, step 3, Heidelberg. My concern is that I don’t want to miss out on this opportunity, being that it’s close to me (aka easy transport) but I also felt that I should give myself a year with my tabletop to really assess how it goes (business wise) before I continue to invest more into this part of my business. Any thoughts / advice for me?! …what’s involved in setting up a studio with a Heidelberg? …is it something I can “learn” on my own.. i.e. through lots of briar press posts and youtube videos? I’m not naive and know that these machines take a lot of experience to get to know and handle properly, but is it something I can do!? Help!! Maintenance, Electrical, Moving, actually running a piece of semi-automated equipment, all are 20X what is required of the user of a tabletop. It’s not a step forward, it’s a couple flights up. This is nothing for a novice; watching someone run the press in person and asking questions would be a wise thing to do before even considering purchasing one. Videos tell you some of the story but not enough. You should meet with an experienced operator, in person, and garner their advice. I advise against the leap to the auto-feeding Heidelberg, but suggest the Pearl or C&P treadle/motor for at least a year. The windmill is a mass-production machine. It is not a blast to operate, it is work that requires absolute confidence and concentration, lest it kill or cripple. Unless you are producing thousands of pieces a day, you don’t need the cost, effort and risk of an auto-feeder. The motorized hand-fed platens can be a joy to operate and they deliver volumes. If you intend to make a business of letterpress printing, as you have indicated, I can see no reason why you should not purchase a machine that close to you if the price is right and it is in good condition. I would, as suggested, get some training on the use of the equipment before attempting its operation, but if the price is right, you could put it into storage for a time while you learned the ropes, and then you’d have a very productive piece of equipment with which to expand your business. I can’t agree that a handfed, motorized press is better in terms of safety than an autofeed press. I’ve been printing for over 50 years now, and the only close calls I have had were on a treadle-operated handfed platen press when trying to re-position sheets which have not fed to the pins well. No matter how disciplined one is, there is a tendency to want to save every sheet. If only a hobby, however, with limited size pressruns, the handfed presses mentioned might be your best option. I can tell you that when given the option between using my handfed platen and the autofeed press, I much prefer the autofeed, unless the run is only a couple hundred pieces. I totally appreciate everyones comments so far… I definitely have a lot to think about. ah! this is all very exciting… just being part of this community makes me smile. Absolutely go see one running in person. It’s intimidating as hell the first time, I promise! I bought one without having used it before and it took me at least a year before I felt truly comfortable with it. The number of controls and adjustments you have make it much more complicated to run, so be prepared for a learning curve. You also must get someone to show you the ropes and even help run a few jobs for you. That all said, I love my Heidelberg. I use it for short runs (under 500) as well as longer 5,000 sheet jobs. Inking, impression and registration are amazing. It’s a great press. Just go into it eyes wide open and get the instruction you need to start. Sarah, its just wise to go into things with eyes open and ‘do your homework’. Find a press, go see someone do more than run it; take a lesson in the finer points of the press and witness the complicated elements at work, then decide if you are the kind of person who is suited to the tasks at hand. Alternately, if the price is right and you don’t need to recover it right away (put the machine to work), buy the Heidelberg, and store it for a year or two. In the interim, get a modest (8 x 12 or 10 x 15) platen and learn what you can on that. Then dig out the Heidelberg and continue the journey. I know a lady who went from a Vandercook to a Heidelberg (she runs a greeting card line as well). It was a challenge for her at the beginning, but the press has allowed her to grow her business exponentially. Now I usually find her running the Heidelberg and Vandy sits idle (she’s keeping it though!). Haha I do think if it works out it’ll go into storage for a year before I touch it. The idea would be to find a few workshops here and there and get some experience. With that said, I did have he wonderful opportunity to work on one here in Montreal last winter. So I am modestly familiar with its beast-like nature! And that small experience did give me insight as to what I’d be getting myself into. I think I’m going to make the trip to TO and see the press…! Take it one step at a time…ah!! I think I’m nuts but the best kind of nuts! *** Plus a good portion of the 2nd hand advice re the complexities of upgrading to a fully automatic from a hand fed are not quite as described;- if as you imply you have, up to a point, mastered the vagaries of operating a Hand Fed press where most operations are very much *Hit & Miss* as witness the many many incessant questions/queries on B.P. herein, . . A H/berg Platen where virtually every operation is factored in with micro adjustments should be No problem to transcribe from Hand Fed to Auto. Vice Versa may not be so easy.!! *** I offer the above not as 2nd hand, but from actual experience from a long time ago, I had the opportunity to acquire a Thompson Platen (English equivalent of H/berg) Good price, Local, etc. I worked on the principle that it was too good to miss, it was potentially a huge mountain to climb from just an Adana T.P. 48, but in essence, I actually did, As above, i.e. side stepped the interim steps. 90% of the learning curve, from the T.P. 48 transcribed upwards, just bigger, certainly No harder, but did have the advantage of a Good, long standing, Auto Platen operator looking over ones shoulder. The teaching did not even cost Cash Money, we merely bartered Teaching in exchange for the use of the M/c.in emergencies. The nice thing about any model of Heidelberg press is there is a good manual for it, thorough and well-written. An experienced printer can learn how to operate the press almost from the manual alone. Manuals for American automatic presses are brief in comparison, few illustrations, and the text can be confusing. I favor the learn the basics first, then jump into a press like the Heidelberg. It was 44 years between my 6x10 Kelsey purchased new to when I got my Heidelberg. I had plenty of time to learn the basics, gain some wisdom, grow old, and figure out that as I lost my youthful mobility, I had to automate. I don’t think anyone should jump into these decisions without a lot of anguish and soul searching and the seeking of advice from as many people as possible. And I waited several decades for prices to get to where my puny resources could afford these outrageous prices being asked today. The only reason I have a Linotype is because it was given to me. I waited 30 years from my instruction on how to operate a Linotype to when one came my way. Haste makes waste. But, realistically, go for it and watch out for the grippers. hehe i just love everyone’s comments hearing tidbits about all your own experiences. i truly do thank all of you for your advice.. and i have to say, i’m torn. but i also have to say, i think i come form a generation (i’m 26) where we just tend to move quick…and it’s a double edged sword. my generation (in my opinion) is very impatient, and sometimes it’s a good things because i push myself to these incredible boundaries that i don’t think are possible at first… and with a lot of sweat, tears (i’m emotional!) and frustrating…i land up getting there through pure determination. and i am just that - determined. i also have to mention this - for those that are a bit more spiritual…when i went to pick up my table top (greatest. day. ever!) i brought it home and it sat in my room for two weeks untouched. i waited to get my papers / inks / cleaning materials, etc. I immediately sign two brides and commit to two full productions that needed to be delivered in 4 weeks from then (yep, i’m nuts). i realize i’ve never even used it and here i am offering my service ha. so with that, i feel this odd sensation of even though it’s not necessarily the order of how i thought i would go about this journey..i feel it’s an incredibly obvious sign to me. and who knows where it will go.. but i feel so overwhelmed by it. 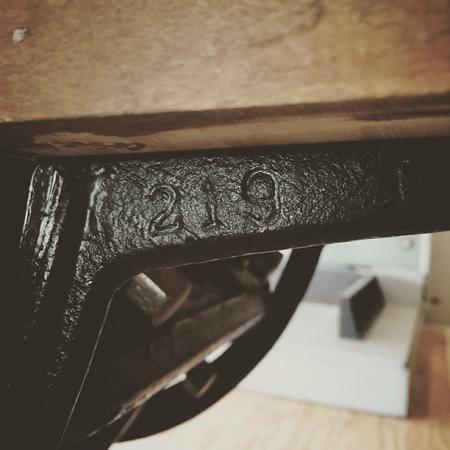 Maybe you should look for a Vandercook 219 first?